WorldClassRoom FAQs - How do I organize my assignments in my course? In this tutorial you will learn how to organize your assignments into Assignment Groups. From within your WorldClassRoom course, click on the Assignments tool in the Course Navigation menu on the left. Here you will find a complete listing of all of the assignments within your course. These may or may not already be grouped with other assignments. From within the assignment tool, instructors have the ability to create assignment groupings to organize their assignments. Once the Add Assignment Group link has been clicked, you will then be able to provide the group a name. Edit the default group name that is provided. Once assignment groups have been created, instructors can sort assignments within the groups. To sort an assignment, grab and drag the assignment using the grab icon to the left of the assignment. The assignment can then be dragged and moved within the group or amongst other groups. Note: The way that assignments are grouped may affect how the total grade is calculated. 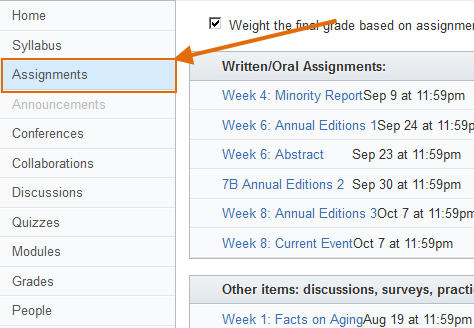 If the box is checked next to "Weight the final grade based on assignment groups" (found at the top of the Assignments page), reorganizing assignment groups will necessitate an update to the grade weighting scheme.